Lens: Your camera accepts Canon EF and EF‐S model lenses; the 18–55mm kit lens sold as a bundle with the camera body falls into the EF‐S category. If you want to buy a non‐Canon lens, check the lens manufacturer’s website to find out which lenses work with your camera. SD (Secure Digital), SDHC, or SDXC memory card: The SD stands for Secure Digital; the HC and XC for High Capacity and eXtended Capacity. The different labels reflect how many gigabytes (GB) of data the card holds. 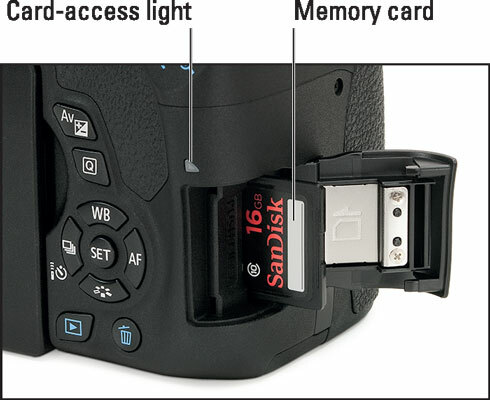 SD cards hold less than 4GB; SDHC, 4GB to 32GB; and SDXC, greater than 32GB. Canon EF‐S lens: The white square is the mounting index. Align the mounting index on the lens with the one on the camera body. 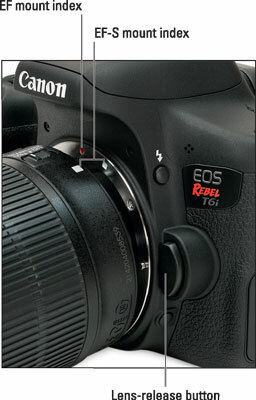 Your lens also has a mounting index; align that mark with the matching one on the camera body, as shown. Place the lens on the camera mount and rotate the lens toward the lens‐release button, labeled in the figure. You should feel a solid click as the lens locks into place. Hold the battery with the contacts down and slide it into the compartment. 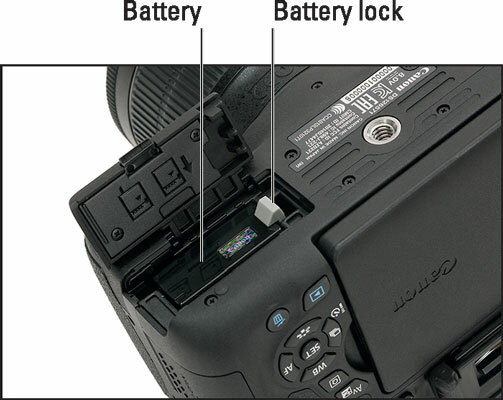 If you’re using the supplied LP‐E17 battery, the Canon imprint faces the front of the camera, and the fine print faces the back. Gently push the battery in until the light gray lock clicks in place, as shown here. Push the battery down until it clicks in place. 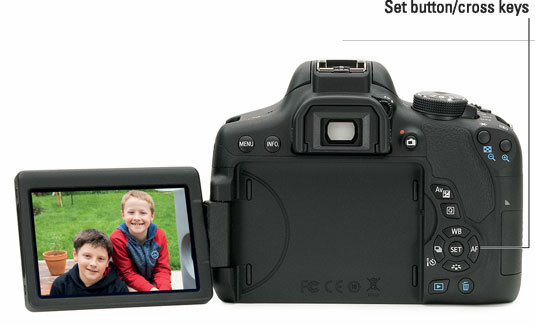 Make sure the camera is turned off and then insert a memory card into the compartment on the side of the camera. Open the memory card door and orient the memory card so that the notched corner is on top and the label faces the back of the camera. Push the card gently into the slot and close the cover. The following figure shows the door open and card partially inserted into the slot. Just above the card door is the card‐access light, labeled here, which lights while the camera is accessing the card, either to read existing data or record the last picture you shot. After you take a picture, make sure that the light is off, indicating that the picture data has made its way to the memory card, before you turn the camera off. When you first take the camera out of its box, the monitor is positioned with the screen facing inward, protecting it from scratches and smudges, as shown on the left in the following figure. Gently lift the right side of the monitor up and away from the camera back. Here are just two possible monitor positions. You then can rotate the monitor to move it into the traditional position on the camera back, as shown on the right in the figure. Or swing the monitor out to get a different viewing angle, as shown in here. You also can rotate the monitor away from the camera to find just the right viewing angle. When you power up the camera for the first time, the monitor displays a screen asking you to set the date, time, and time zone. The date/time information is included as metadata (hidden data) in the picture file. You can view metadata in some playback display modes and in certain photo programs, including Canon Digital Photo Professional. The easiest way to adjust the settings is to use the touch screen, which is enabled by default. Just tap an option to select it and then tap the up/down arrows at the bottom of the screen to set the value for that option. Finally, tap the OK icon to exit the screen. You also can adjust settings by using the Set button and the four keys surrounding it, known as cross keys. Press the left/right cross keys to highlight a setting, press Set to activate the option, press the up/down cross keys to change the value, and then press Set again to finalize the change. This step is critical; if you don’t set the viewfinder to your eyesight, subjects that appear out of focus in the viewfinder might actually be in focus, and vice versa. If you wear glasses while shooting, adjust the viewfinder with your glasses on. Use this dial to adjust the viewfinder focus to your eyesight. Look through the viewfinder and notice the thin black lines near the center of the frame. The lines represent the boundaries of the autofocus area (the portion of the frame that the camera considers when setting focus). If you can’t make out the lines, point the lens at a light‐colored surface so that they’re easier to see. You also can press the shutter button halfway to display shooting data at the bottom of the viewfinder, as shown in the figure. In dim lighting, the built‐in flash may pop up when you press the shutter button halfway; ignore it for now and close the flash after you adjust the viewfinder. Rotate the adjustment dial until the viewfinder markings and data appear sharpest. Ignore the scene you see through the lens; that won’t change because you’re not actually focusing the camera. Can’t get the display sharp enough? You may need an adapter that enables further adjustment of the viewfinder. Look for an E‐series dioptric adjustment lens adapter. Prices range from about $15–$30 depending on the magnification you need.